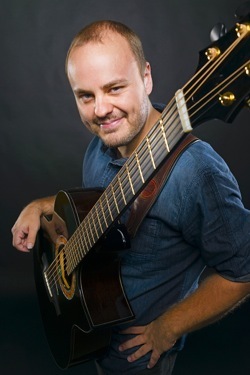 The ever busy Andy McKee is set to embark on another extensive U.S. trek, with a 39-date U.S. tour kicking off September 16th in Lawrence, KS. The acclaimed acoustic guitar virtuoso will be out in support of the recently-released Mythmaker, his first new music in four years. Read our exclusive interview with Andy McKee, and read our review of Mythmaker here. Mythmaker was released on April 8th and is Andy’s first release since 2010’s acclaimed album Joyland. The four-song EP features him playing electric guitar and piano for the first time on record. The EP’s beautiful title track and “The Reason” showcase his renowned, signature acoustic playing, and he then throws the listener for a loop with the epic multi-instrumental “Lumine” and the lush solo piano piece “June” which is dedicated to Andy’s mother and grandmother. Mythmaker is the sound of a master musician expanding his artistic horizons and fearlessly delivering the unexpected. Mythmaker also happens to be the name of Andy’s newly created record label which he will use to release new music much more frequently than in the past, as well as music from artists he adores. “I envision the Mythmaker label to be a home for creative and highly unique musical artists,” he says. He’ll also release his first live concert Blu-ray/DVD later this year through the imprint. Liked this article? Pass it along! This entry was posted in Acoustic Guitar News and tagged andy mckee by Alan. Bookmark the permalink. Copyright © 2019 Acoustic Guitar Playing. All Rights Reserved.